Buckdeer faced a career change. He was, by all measurements, a failure. A name change and career switch later, he’s back in the saddle again. At least, his owner, University of Wyoming junior Lindsay Zacco, is. 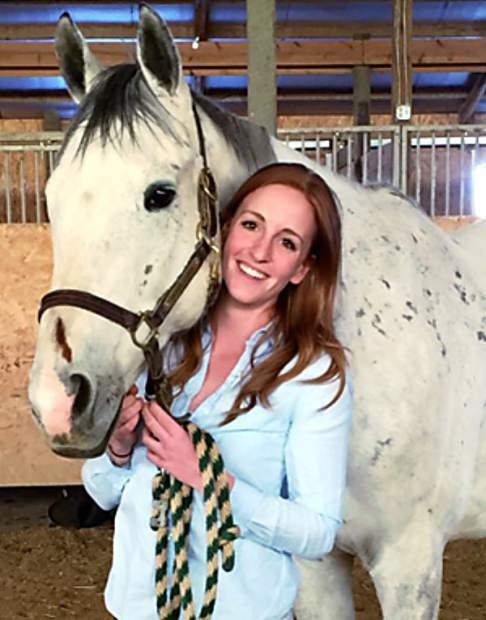 The thoroughbred that finished dead last in his only race gave her the courage to pursue her dreams, said Zacco, an animal science major who has an equine science option. Buck was sold at age 3 to a trainer at the same Pennsylvania horse barn Zacco used. Buck was to be trained as a hunter-jumper horse after his failed race career. Zacco said Buck wasn’t working out with his new owner. She bought him for $1 two years later, and a few years after that, Buck was in a horse trailer bound for college in Wyoming with his owner. Buck got a name change and would major as a hunter-jumper with a minor in western trail. The horse excelled in March at the Colorado Most Wanted Thoroughbred event, a competition that promotes rescue of unwanted thoroughbred racehorses. He showed off his ranch horse and jumping skills and, with Zacco aboard, he’s at home on the range herding cattle or helping guide horse tours on dude ranches. When younger, she and her parents vacationed at a dude ranch near Jackson. Wyoming always called to Zacco. She would later work at the same dude ranch with Buck. By coincidence, a Pennsylvanian posted the Colorado competition on Zacco’s Facebook wall. Zacco said Buck qualified because he had been boarded in Colorado during the year (He’s now about five minutes from Laramie). The Retired Racehorse Project sponsors Colorado’s Most Wanted Thoroughbred event. Today’s unwanted horse topic is very relevant in the equine industry, said Jenny Ingwerson, an equine lecturer in the Department of Animal Science in the College of Agriculture and Natural Resources. She said the number of unwanted horses, neglect, abuse and welfare cases have increased with horse slaughter banned in the United States and the drop in the economy. “Many unwanted racehorses can end up as an animal welfare case or going to slaughter, even though it isn’t legal in the United States,” she said. Some ex-racehorses do find good homes and alternative futures, she noted. The Colorado event showcases what the ex-racehorses can do, Zacco said, including jumping, which Buck does naturally. They rushed him to Colorado State University, where he stayed for two weeks. The jumping comes naturally to Buck. That characteristic taught Zacco patience, she said.